Google is everywhere and provides free services to everyone. Amongst the huge list of services publicly available, there are the Google DNS, well known as 8.8.8.8, 8.8.4.4 (IPv4) and 2001:4860:4860::8888, 2001:4860:4860::8844 (IPv6). But Google is far from being a non-profit organisation and they collect a lot about you via their DNS. Nothing is free and, when you get something for “free”, you (your data) are the valuable stuff. Never forget this! 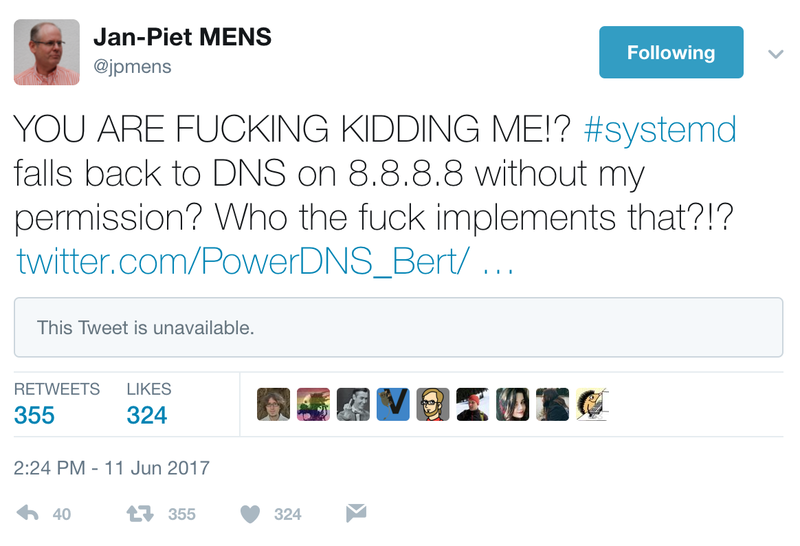 Yesterday, there was some interesting tweets passing around about the same kind of behaviour but for systemd. "systemd" is the new system introduced in 2012 to replace the good old “init”. It is used to manage processes started at boot time (in userland space). systemd introduced a lot of new features but also was the reason of major flamewars in the Linux community about pros and cons of the new system. Some distributions, like Slackware, never implemented systemd. I also found an old report about this in the Debian bug tracker. Ok, nothing really critical here. Based on the tested distributions, there is almost no risk to see systemd falling back to the Google DNS. However, this is a good signal to keep in mind that some developers might introduce dangerous features and/or configurations in their code. Grepping for static IP addresses in configuration files is always a good reflex. About the DNS, my recommendation is to restrict the DNS traffic on your network and run your own resolver.